Personally? I've always thought that the Outers were far more powerful than the Inners. Um, hello? Saturn can destroy whole -worlds-, Pluto can control time... and, well, Pluto, Neptune, and Uranus all have their separate talismans (which I wish would have been explored more in the anime--I think they're powerful in their own regard). What do the Inners have? Their... sailor crystals? The Outers have those too. The Outers have just always struck me as more powerful--but also more mysterious in the strength of their power. Now, onto a more controversial part of the same topic. Moon. Sailor Moon can't really do anything. I mean, in her upgraded Princess Serenity or Neo-Queen Serenity form, the can use the Ginzuishou offensively and such. But just in her senshi form, the only thing that seperates her from the rest is her healing-based powers. I'm gonna go off on a tangent here--I also think Saturn (and sometimes, Pluto) are more powerful that Moon, as well--in all of her incarnations. I mean, Saturn, I know, she dies if she uses her power to its full potential. But isn't that a sign of JUST how powerful she truly is? And, I mean, ALL of the sailor senshi were terrified of her being awakened. That says something, now doesn't it? But, what do you guys think? Is Saturn or Pluto more powerful than Moon (JUST in her senshi form, without her princess/Neo-Queen form in mind)? Are the outers more powerful than the inners? Why or why not? It's been my impression that the Outer Senshi were indeed stronger than the Inner Senshi. Their task (Uranus, Neptune, Saturn, and Pluto) is to protect the Solar System against intruders. Their group is smaller, but more "specialized," so to speak, like the shock troops of the Sailor Senshi. The Inner Senshi were tasked with protecting the princess and Earth which, while still an enormous role, was not quite as all encompassing as that of the Outer Senshi. It's also implied throughout the series that the Outer Senshi are either outright stronger or at least consider themselves to be that way. The power gap is also reinforced by their age differences and relatively maturity and resourcefulness when encountering a challenge. That being said, such is my opinion within the context of the standard definition of power. The Outer Senshi regularly exercise authority in such a manner that indicates they wield greater power than their Inner counterparts. They're even given to ignoring orders from their de jure leader: Sailor Moon, their princess! If I were to approach power from a slightly more dynamic view, I would argue that Sailor Moon, with the strength of her spirit and the Silver Crystal, is the ultimate power amongst the Sailor Senshi. As such, the Inner Senshi tend to recognize multiple solutions to a problem which doesn't necessarily involve sacrificing the lives of noncombatants or obliterating their enemies. This is more so stressed in the anime than the manga. Therefore, if we judge power on a scale of potential destruction, then the Outer Senshi definitely prevail, especially with Sailor Saturn on their side. If we judge power on the basis of creating and maintaining life, then the Inner Senshi and Sailor Moon are certainly more "powerful." I remember it was stated that the outer senshi are more powerful, but it`s mainly because their missions are different and because they usually use their full potential while the others, mainly Moon, don`t. Pluto goes on to explain this is because, like it was posted above, they were the first line of defense. We don't see much of Pluto using her authority over time in a battle, but if she has absolute control, she'd be the strongest: I mean, she could just break up the enemy's parents when they were on their first date, or keep resetting the battle when a blast is headed towards her. Or she could slow down time to make herself 1,000x faster than the enemy and just stab them with a fork or something while they could hardly move. Which one is strongest relies on Pluto's level of control and strategy. For sheer power, it would be Saturn, who blew away Master Pharaoh 90, against whom Sailor Moon and the others were powerless. She exists, in effect, to take out enemies the others cannot defeat. Saturn is like a kamikaze who blows up everything to confine an evil from invading the rest of the galaxy when there is no way for the others to defeat it... Because of that function, she seems to have the most raw power- to an extent that her body can't even handle it, and she self-destructs when releasing it fully. 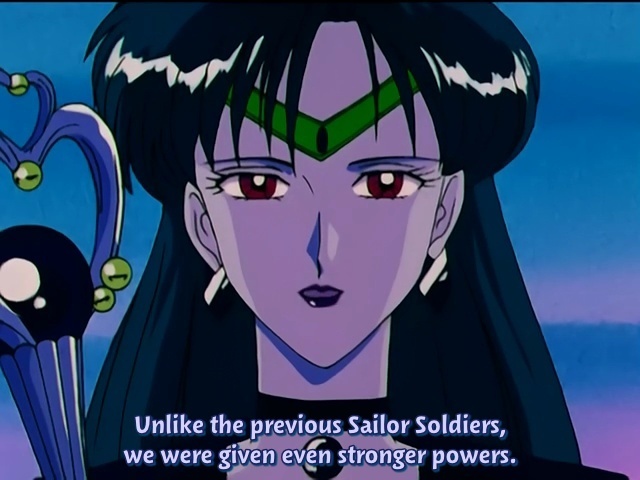 I agree with you on the notion that the outer senshi are stronger than the inner senshi with their powers. People have already answered why but yes, it is also stated in the manga as to why the outer senshi are stronger -- they protect the outer edges of the universe and are the first line of defense. They are stronger -- in power. They are not, however, stronger in heart. The inner senshi show on countless occasions in both the anime and the manga their strength of heart and belief in love and friendship. I believe this heavily stems from their close relationship with Usagi. The outer senshi lived their lives in seperation and seclusion -- they never had the chance to form strong bonds. Their strength needed to lie in their powers and their resolution to stand unforgivingly against any intruders. As it has been mentioned in the manga, it is Usagi's pure light that attracts creatures from all over the universe. It is also her love and affection that binds her friendships and relationships together. The inner senshi are stronger than the outer senshi because they believe in Usagi's love and faith that Good will always prevail. The outer senshi are, in a way, tainted by their loneliness and hardened resolves. They are quicker to admit defeat than the inner senshi are. As to your notion that Sailor Moon is quite useless and weak -- only having the ability to heal -- I am quite surprised at that. Are you perhaps basing your opinion on the anime? Because then you are absolutely correct. All she does in the anime is heal the enemy or seal it once all the other senshi have done "the dirty work." It is pathetic and insulting to her character. In the manga, Usagi is a warrior. Once she blossoms in volume 2, Sailor Moon is quick to take the intiative and often attacks before her counterparts get the chance to do so. She is the one that bestows the ability to her senshi to transform to the next level of their powers (unlike the reversal in the anime). Sailor Moon is a dangerous individual to battle. She believes in her ability as a Senshi and she can vanquish any enemy regardless of receiving assistance from others. She is courageous in regular battles and more times than not, single-handedly defeats the final enemy at the end of each Arc. There is nothing weak nor useless about Sailor Moon in the manga. Wow! I'm surprised at the overwhelming opinion that the outers are stronger then the inners. I mean, I know it was stated in both the anime and manga--but I have come across a lot of people who don't think the outers are as strong as the inners, much less stronger. Sailor Jupiter--Yes, I was mostly talking about the anime. I pretty much despised Usagi in the anime, as well as Mamoru, and Usagi/Mamoru. I liked her in the manga and I thought she had much more development and things were just more... explained, I suppose? But it's been a couple years since I read the manga, so my memory of it is faint, at best. Although, I have to disagree with you about the fact that the outers are lonely. I think they do have a very strong bond--they are very serious and dedicated to their duties, and this seriousness and dedication ties them together. I think that in a lot of ways, they are closer to each other because of their loneliness and shared duties. They know that they have to sacrifice such bonds because they have to protect the Universe at large. So, no, I still hold the belief that the outers are stronger despite the inners "bonds" with each other. But, I suppose, as Thereisnospoon303 stated, it all depends on what you think power is. If it was all about love, then Moon and the Inners would prevail. If it was about destruction and sheer power, the Outers would prevail. The outers are tough as nails, basically! I mean, I think there are definitely a lot of different sorts of power in the series, and theirs really isn't about love per se (that is to say not so intrinsically dependent on love) so much as sheer bloody-mindedness - my impression is that they're the ones who can be cold as anything when they need to so that Sailor Moon will never have to go there. Her power is so dependent on always believing in love and being completely without cynicism that people like the outer senshi at a distance around her seem really necessary. Someone has to look at situations and go "no, really, what IS the worst that could happen?" and then plan accordingly. I agree. They're the tough ones who let her keep her hands clean, and kind of protect her from having to know how awful things can be: kind of like what older siblings do. As for Moon, I think she is definitely the most powerful of them all. I do believe if it was truly what Usagi wanted, the silver crystal could cause mass destruction, because if it couldn't, there's no reason that it would be dangerous for the enemies to have it. However, even just with its healing properties, the silver crystal shows itself "stronger" than the outers or inners by defeating enemies that they could not. I really think that the outers are a lot more powerful than Sailor Moon is. It's really clear in the show especially with Saturn and Pluto. Sailor Moon is strong, but not THAT strong. I'm sure though if she tapped more into the silver crystal's abilities though she would be capable of so much more. It's complicated for me on my end. While there is definite proof in the 90s anime that the outers are indeed stronger since they're the initial line of defense, it seems to me in the manga they weren't as tank-ish. Mostly after the end of the Super arc; in the manga (and most likely sailor moon crystal) when Hotaru grew and gave them their super senshi abilities, it seemed like they were a bit more on par with the others then they were in the previous arc. And don't get me started on how easily they were taken down by galaxia. Perhaps that had to do with the reincarnation process/rebirth of sailor saturn after Usagi healed the planet after Saturn's sacrifice?